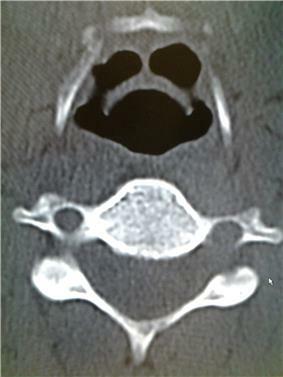 Neck X-ray showing thumbprint sign. Epiglottitis is an inflammation of the epiglottis — the flap at the base of the tongue that keeps food from going into the trachea (windpipe). Due to its place in the airway, swelling of this structure can interfere with breathing, and constitutes a medical emergency. Infection can cause the epiglottis to obstruct or completely close off the windpipe. With the advent of the Hib vaccine, the incidence of epiglottitis has decreased, but the condition has not been eliminated. Epiglottitis involves bacterial infection of the epiglottis, most often caused by Haemophilus influenzae type B, although some cases are attributable to Streptococcus pneumoniae, Streptococcus agalactiae, Staphylococcus aureus, Streptococcus pyogenes, Haemophilus influenzae, and Moraxella catarrhalis. Epiglottitis commonly affects children, and it is associated with fever, difficulty in swallowing, drooling, hoarseness of voice, and typically stridor. Stridor is a sign of upper airways obstruction and is a surgical emergency. The child often appears acutely ill, anxious, and has very quiet shallow breathing with the head held forward, insisting on sitting up in bed. The early symptoms are insidious but rapidly progressive, and swelling of the throat may lead to cyanosis and asphyxiation. Epiglottitis is an airway emergency and intubation is required initially. Since the introduction of the Hemophilus influenzae (Hib) vaccination in many Western countries, childhood incidence has decreased while adult incidence has remained the same; the disease is thus becoming relatively more common in adults than children. Modern cases in adults are most typically seen among abusers of crack cocaine, and have a subacute presentation. 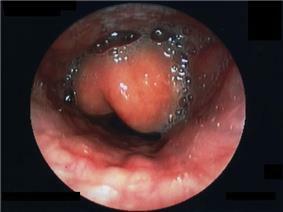 Diagnosis is confirmed by direct inspection using laryngoscopy, although this may provoke airway spasm. 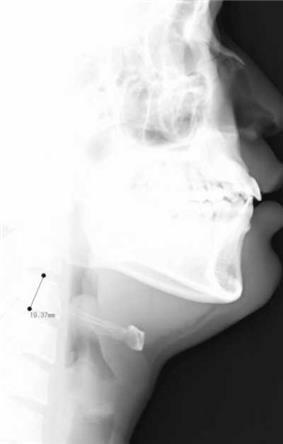 If epiglottitis is suspected, attempts to visualise the epiglottis using a tongue depressor are strongly discouraged for this reason; therefore, diagnosis is made on basis of direct fibreoptic laryngoscopy carried out in controlled environment like an operating room. Imaging is rarely useful, and treatment should not be delayed for this test to be carried out. The epiglottis and arytenoids are cherry-red and swollen. The most likely differential diagnostic candidates are croup, peritonsillar abscess, and retropharyngeal abscess. On lateral C-spine X-ray, the thumbprint sign (or "thumb sign") describes a swollen, enlarged epiglottis; usually with dilated hypopharynx and normal subglottic structures. On CT imaging, the "halloween sign" describe a normal thickness epiglottis. It can safely exclude the acute epiglottitis. Furthermore, CT imaging can help to diagnose other conditions such as peritonsillar abscess or retropharyngeal abscess which had similar clinical features. CT imaging showing the "halloween sign"
The lateral soft-tissue radiograph reveals the “thumb sign” that indicates a swollen epiglottis, suggestive of epiglottitis. The diagnosis was confirmed on subsequent imaging and laryngoscopy. The patient recovered following treatment with predonine and ceftriaxone. Left column: Normal epiglottis. Right column: Epiglottitis. Epiglottitis may require urgent tracheal intubation to protect the airway, though this is not always the case. In some cases, epiglottitis requires the use of antibiotics while the patient benefits from a breathing tube. In more serious cases, tracheal intubation is necessary. In such cases, immediate intubation is not advised, because the inflamed epiglottis is very sensitive and the care provider may irritate the epiglottis with the laryngoscope, causing the epiglottis to close off completely and forcing the use of a surgical airway opening (cricothyrotomy). Most children can be managed by keeping lights low and the child calm and in a position of comfort. Intubation may still become necessary if the child begins to rapidly decompensate and show signs of impending respiratory arrest (decreased work of breathing with abnormal skin signs). If the patient's stridor becomes quieter, obstruction is likely to follow, and thus intubation should be expedited even further. In addition, patients should be given antibiotics, such as second- or third-generation cephalosporins, either alone or in combination with penicillin or ampicillin for streptococcal coverage. If allergy to penicillins is present, Co-trimoxazole or clindamycin is an alternative. In household contacts of any unvaccinated child infected with H. influenzae, rifampicin is used as prophylaxis. Some patients may develop pneumonia, lymphadenopathy, or septic arthritis. ^ Keyser JS, Derkay CS (1994). "Haemophilus influenzae type B epiglottitis after immunization with HbOC conjugate vaccine". Am J Otolaryngol 15 (6): 436–43. ^ McEwan J, Giridharan W, Clarke RW, Shears P (April 2003). "Paediatric acute epiglottitis: not a disappearing entity". Int. J. Pediatr. Otorhinolaryngol. 67 (4): 317–21. ^ Bowman, Jeffrey. "Adult Epiglottitis". eMedicine. MedScape. Retrieved 2010-12-30. From 1996-2005, with the introduction of widespread H influenzae type b vaccination, an incidence of only 0.02 cases per 100,000 per year was seen. During this period, the incidence of acute epiglottitis in adults remained constant, at 1.9 cases per 100,000 per year. ^ Jaffe JE. Acute Epiglottits. eMedicine.com. Available at: http://www.emedicine.com/Radio/topic263.htm. Accessed on: December 21, 2010. 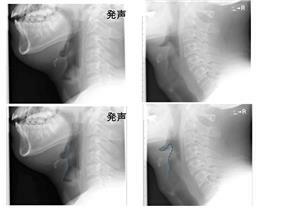 ^ Four cases of acute epiglottitis with a peritonsillar abscess. Ito K. Chitose H. Koganemaru M. Auris, Nasus, Larynx. 38(2):284-8, 2011 Apr. ^ Peter Henriques, He Died as He Lived: The Death of George Washington (Mount Vernon, VA: Mount Vernon Ladies Association, 2000), 27-36.